Natural fancy yellow diamonds begin where the colorless D-Z grading scale ends. Although some stones on the colorless scale may exhibit a yellow tint, they are not considered Fancy Yellow. These stones are referred to as "Cape" colors, and are graded as follows: K-M (Faint Yellow), N-R (Very Light Yellow) and S-Z (Light Yellow). Once a stone demonstrates a yellow hue that extends beyond the Cape classification described here, it is considered a fancy yellow diamond. Fancy yellow diamonds (otherwise known as Canary diamonds) and fancy brown diamonds (otherwise known as Cognac or Champagne colored diamonds) are the only color diamonds that start from within the colorless grading scale. Similar to other fancy colors, fancy yellow diamonds acquire their color due to the presence of trace elements in their atomic structure. In the case of yellow diamonds, this element is nitrogen, which when bonded to the carbon atoms that make up all diamonds, presents a vibrant yellow color. The more nitrogen is present, the more saturated with yellow color the diamond will be. The amount of color saturation is measured on the intensity scale. Yellow colored diamonds starting from Cape colors (4 stones on the left are from the U-V through X-Y-Z range) continuing to Fancy Light Yellow , Fancy Yellow, Fancy Intense Yellow, Fancy Vivid Yellow and Fancy Deep Yellow. Fancy yellow diamonds are graded according to the hue of yellow color within the stones. In general, diamonds at the top of the scale contain the weakest tone of yellow and are known as Light Yellow diamonds. These stones are dominantly yellow but with almost equal traces of white throughout the stones. At the other end of the scale, stones that contain the strongest tones of yellow are known as Fancy Vivid Yellow diamonds. Vivid yellow diamonds have no white traces and, depending on the color saturation and distribution, contain an extremely yellow color throughout. The fancy yellow colored diamond scale is not as simple as a straight line with different shades of color. Pure yellow diamonds with no overtones are found with six different color grades: Light (X-Y-Z range), Fancy Light, Fancy, Fancy Intense, Fancy Vivid, and Fancy Deep - and all are 100% completely natural. Yellow diamonds with overtones, can also appear with a Fancy Dark intensity. The further along this yellow diamond scale you go, the richer and more intense the color is to be seen in the diamond. The more intense a stone's color saturation, the more it will be worth. For example, a Fancy Intense Yellow diamond will be worth more than a Fancy Yellow. That said, collectors tend to prefer Fancy Vivid Yellows to Fancy Deep Yellows. Intensity may be considered the single greatest contributing factor to yellow diamond value. Sometimes, the cut of the diamond actually enables a better intensity of color to show from the finished product, hence the importance of purchasing a diamond from someone you trust. While yellow diamonds are still extremely rare, as a result of how abundant they are in comparison to other fancy colors, their prices are competitively affordable. In fact, there are many that feel that going with a fancy yellow diamond is a perfect introduction to the fancy colored diamond world since the appearance is magnificent while the cost is not as extravagant. The most popular shades are Fancy Yellow and Fancy Intense Yellow stones and for those who can afford them, also Fancy Vivid Yellow. A pure or straight fancy color stone with only one color present is preferred by most, but the majority of color diamonds actually contain one, two, or even up to three overtone colors. 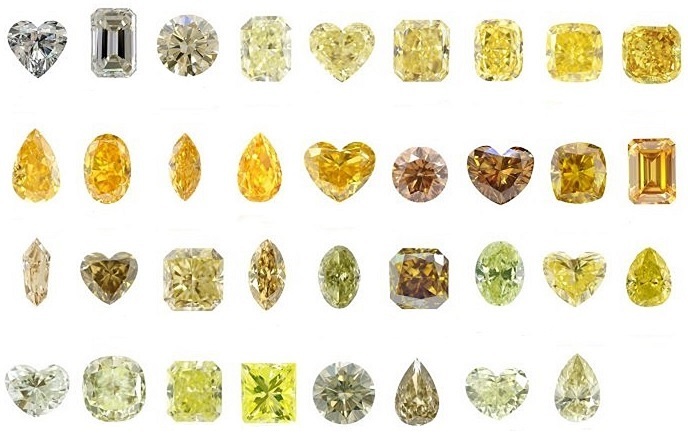 The secondary shades most common in fancy yellow diamonds are green and orange. The pure dark tones often contain brownish or greenish hues. Although most buyers prefer a pure color stone, certain color combinations, such as an Orangy Yellow, can really be quite mesmerizing. 1st row: Cape, Pure Yellow. 2nd row: Orange Yellow, Orangy Yellow, Brown Yellow, Brownish Yellow, Brownish Orangy Yellow. 3rd row: Brown Greenish Yellow, Brownish Greenish Yellow, Greenish Yellow. 4th row: Green Yellow, Grey Greenish Yellow and Greyish Greensih Yellow. Some Yellow diamonds are also Chameleon Diamonds, where the diamond temporarily changes its color when gently heated or when left in darkness for a period of time. Tone refers to the lightness or darkness of a canary diamond, and the continuum in between. GIA grading does not make a distinction in tones, but to the eye a stone with darker tones may appear more intense in color. For someone looking for the appearance of a Fancy Intense Yellow diamond without the price tag of one, a good option may be a fancy yellow diamond with a darker tone. It is very common for natural fancy yellow diamonds to display fluorescence. In fact, about 25% of all yellow diamonds are fluorescent, with over 90% of those blue fluorescence. The presence of fluorescence itself does not necessarily devalue a yellow diamond; it can even lend it a greenish cast that provides a cool undertone to such a stone and make it appear lemony and, to some, more desirable. Fluorescence is also manifest in colors other than blue, including green, white, orange and yellow. In the final analysis, the enhancement to a stone's aesthetics that fluorescence offers is entirely subjective. Because yellow diamonds are more abundant than other fancy colors (such as pink, blue, green, etc. ), clarity plays a much more important role as a differentiator than it may in the case of other colors. In the case of a pink or blue, a lower clarity may not make as much difference due to the overall rarity of the stone. In the case of yellows, a higher clarity will be the dividing line between stones of similar intensity. Canary yellow diamonds tend to contain fewer inclusions than other colored diamonds. Nearly 75% of all yellow diamonds attain a clarity grade of VS or higher. Because round cuts tend to produce lower color saturation, yellow diamonds, like other colors, are generally cut into fancy shapes such as cushions, emerald cuts, princesses, etc. Round cuts cause color desaturation because they are best at reflecting white light, which also gives them their scintillation. In the case of yellow diamonds, a round cut may make the yellow color appear fainter, whereas a fancy shape, which reflects less white light, will maximize color saturation. Take note of uneven color distributions as well (these will be noted on your GIA certificate), as they can certainly affect a diamond's appearance and value. Due to both rarity and beauty, fancy yellow diamonds have more recently been used as the center piece of some of the most breathtaking engagement rings. Every woman wants the ring of their dreams, and most would like to have the ring of everyone else's dreams as well. Natural fancy yellow diamonds have the ability to be far more alluring than the everyday colorless diamond engagement ring, especially since they are so much more unique. As a result of their abundance in nature, fancy yellows are quite reasonably priced, yet still astonishing to look at especially when set in a beautiful engagement ring. Yellow is one of the most common colors in the fancy color diamond universe. Approximately 60% of all fancy color diamonds fall somewhere in the yellow spectrum. That said, because only one in 10,000 carats produces a color diamond, yellows are still pretty rare in the realm of all diamonds. Because of their striking color and relative accessibility as compared to much more rare color stones such as pinks or blues, canary yellow diamonds are very popular and represent excellent investment opportunities. When considering a yellow diamond as an investment, opt for stones with deeper color saturation, higher clarities, larger sizes (two-carat-plus) and less common shapes (such as rounds). Natural yellow color diamonds are far more common than most of the other fancy color diamond colors. Since they are so striking and alluring, while still remaining competitively affordable, the demand for yellow stones has aggressively and steadily increased over the past three decades. Yellow diamonds with a high clarity grade (IF or VS), high intensities, and usually above 2.00 carats - 3.00 carats (obviously, the bigger the better) make for superb investment opportunities and are sought after as excellent additions to many fancy color diamond investment portfolios. Some of the highest prices at auction have actually been paid for large yellow diamonds. It is rare for any color diamond to display its primary color in pure form. Most colored diamonds contain secondary or even tertiary color modifiers, or overtones. In the case of a canary diamond, these are most commonly brown followed by green and orange. Stones with secondary color overtones are referred to by name incorporating both (or all three colors). For example, "greenish yellow" or "brownish greenish yellow." The presence of brown as an overtone may have a slight negative impact on the price of a natural fancy yellow diamond, while the presence of orange or green, given their rarity in combination with yellow, may enhance the stone's value. Distinct from overtones are split grades, namely stones that exhibit two colors (with one being the dominant color). For example, a stone may be graded as green-yellow, with the color listed in second position, in this case yellow, being the dominant hue. Split grades can affect yellow diamond value, but that depends entirely on the combination of colors. For instance, a split grade brown-yellow stone may be worth less than an intense yellow, but a split grade green-yellow may be worth more. Yellow diamonds were first found in the Cape Province of South Africa in the 1860s, which is why faint yellow diamonds (those at the outer perimeter of the D-Z colorless diamond scale) are called "Cape" colors. However, despite their provenance from South Africa's Kimberley and Dutoitspan mines, historical documents note that yellow diamonds were in use as far back as the 17th century, indicating a much earlier original discovery. Some of the most famous fancy yellow diamonds are The Incomparable, The Tiffany Yellow, The Allnatt, The Florentine. Canary yellow diamonds, which is another name for natural yellow diamonds, are recognized because of their strong color and their unusual characteristics. Zimmi yellow diamonds, another name that is used for yellow diamonds, are called this when they come from Sierra Leone and exhibit an especially beautiful yellow color. Of course, similar to any other diamonds in the market, fancy yellows can be found in all cuts, such as asscher, oval, marquise, pear, radiant, heart, cushion, round and princess.